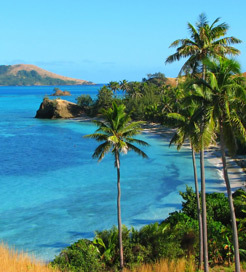 Nacula is the third largest and the northernmost island in the Yasawa group, situated alongside Fiji’s north-west coast. It’s one of the archipelago's more laid-back islands, offering quiet beaches, luxurious resorts and home to only four villages: Nacula, Malakati, Naisisili and Navotua. It offers some of Fiji’s finest snorkelling and scuba diving opportunities, particularly at Long Beach with its turquoise waters teeming with sea turtles and colourful marine life. You can attend beginner dive courses or join a boat trip to some of the more advanced dive spots which include underwater caves. After relaxing by the sea, venture inland to explore the beautiful, hilly landscape using the impressive network of hiking trails. You may even come across some friendly locals on the way. Some of the peaks along the trail reach around two hundred metres and offer sublime views over the reefs and bays, so remember to bring a camera. A great way to end a day in Nacula would be to sample some delicious mudskipper coconut curry. It is a curious looking amphibious fish that lives in the tidal streams among the mangroves. There are three ferry terminals on Nacula Island: Blue Lagoon Beach Resort, the Port of Nabua and Safe Landing Resort, which are all situated in the south. There are daily crossings from Denarau on the Fijian mainland to Nacula, with an average journey time of four and a half hours. For more information, please visit our Ferries from Fiji to Nacula Island page.